Since the 2011 summer protests, the middle class has become one of the most talked about issues in Israel. 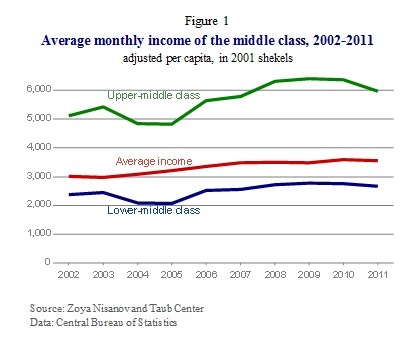 A new study published by the Taub Center and written by Dr. Zoya Nisanov of the Economics Faculty at Bar-Ilan University analyzes the middle class, to which the majority of Israelis belong, from a variety of angles, presenting new findings on the composition of this class, the income levels of its members, and trends within this group. The research will be presented for the first time at the conference of the Israel Economic Association. Nisanov uses a model that divides the population into income groups according to the best fit of the distribution of incomes. The main finding is that in Israel there are four economic classes – upper, upper middle, lower middle, and lower. Therefore, it is more accurate to relate to the middle class in Israel not as a single, homogeneous group, but rather as two separate groups differentiated not just by their income levels but also by their socio-demographic characteristics. According to the study by the Taub Center, the lower middle class includes households with a monthly income of between NIS 1,950 and NIS 5,000 adjusted per capita, weighted according to 50 to 130 percent of the adjusted per capita median income – a group whose size is 40 percent of the overall population. The upper middle class households have a monthly income of greater than NIS 5,100 but less than NIS 12,540 adjusted per capita (up to 320 percent of the median income). This group is some 29 percent of the overall population. As can be seen in Figure 1, between 2002 and 2011 the gaps between incomes in the two groups widened. The lower middle class became poorer relative to the upper middle class. 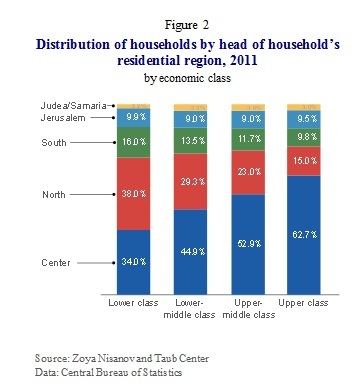 Through a series of segmentations according to various socio-demographic characteristics, the Taub Center study examined the composition of the various classes, including the composition of the middle class in Israel. The findings revealed that despite all of the attempts to achieve more equality among the different societal groups, there are still large gaps that make it more likely for certain population groups to belong to higher socioeconomic classes. According to Nisanov’s study, the most important factor explaining gaps between groups is the number of wage-earners in the household. Amongst the two lower social classes, the rate of households with less than two wage-earners was very high (some 95 percent in the lower class and some 59 percent in the lower middle class), while some 25 percent of upper middle class households and some 15 percent of upper class households had less than two wage-earners. These findings can explain, at least in part, the lower likelihood that Haredim, Arab Israelis and immigrants will belong to the middle class, since in these households the number of wage-earners is particularly low. Only some 31 percent of Arab Israeli households, for instance, have more than one wage-earner. Nisanov examined the influence of various socio-demographic variables on the likelihood of a household belonging to each of the classes and found that being a Haredi household raised by 42 percent the chances of a household belonging to the lowest social class. Being an Arab Israeli household increased the chances of belonging to this social class by 18 percent, while it lowered the likelihood of belonging to the upper middle class by 15 percent. Another important variable that plays a role in keeping Haredim and Arab Israelis from belonging to the higher social classes is the number of children in these households. The study found that every additional child under the age of 18 increases the likelihood of the household belonging to a lower class. Nisanov also found that the older population is being left behind in the area of income. The lower middle class was comprised of more older-adults (aged 55 and over), while the upper middle class had more heads of households aged 35-54. The upper middle class is the youngest social class (45 on average), and the age of the head of household is lower on average by nearly three years than the average in the lower middle class. The lowest class is also the oldest group. This leads to the conclusion that the probability of belonging to the group with the highest income rises until a certain age, and then declines. As expected, place of residence has an influence on class status, with residents of the central region being most likely to be amongst the higher classes relative to households living in the south or north of the country (Figure 2). 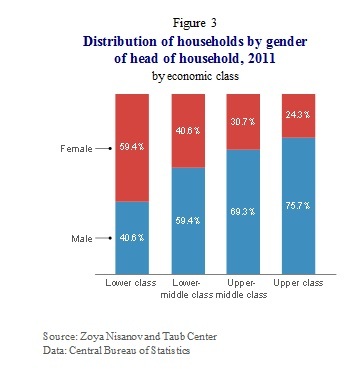 The differences in class according to the gender of the head of household (Figure 3) reflect the fact that households headed by women generally have only a single wage-earner (e.g., widows, single parents, or Haredi women), and thus are mostly in the lower classes. For example, it was found that in one-third of poor households headed by women, the women are widows. The influence of this characteristic is considerable also when the data was segmented by family status: married couples have a higher chance of belonging to higher income groups. Figure 4 presents the division of income groups by continent of birth. 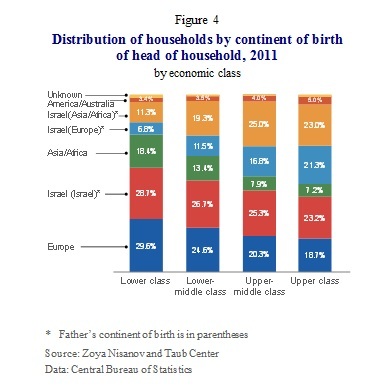 It was found that amongst those born in Asia/Africa, the chances of belonging to the lower class was greater, while amongst their children who were born in Israel, their chances of being in a higher class grew. Specifically, it was found that heads of households born in Africa had a higher chance of belonging to low income groups than those born on other continents, while those born in Europe had a higher chance of belonging to higher income groups. In the Taub Center study, Nisanov examines the influence of child allowances and old-age allowances on the income distribution of households. According to her findings, there is no proof for the conjecture that child allowances contribute to a lessening of the polarization between rich and poor, at least not since the cuts of 2003. In Nisanov’s words: “This combines with an overall decrease in the effectiveness of taxation as a tool for narrowing gaps in Israel, as well as a decrease in the effectiveness of the policies directed toward this goal in general.” On the other hand, old-age allowances have been shown to be a more effective tool in narrowing income gaps. The Taub Center for Social Policy Studies in Israel, headed by Professor Dan Ben-David, is an independent, non-partisan institution for socioeconomic research based in Jerusalem. The Center provides decision makers, as well as the public in general, with a big picture perspective on economic and social areas. The Center’s interdisciplinary Policy Programs – comprising leading academic and policy making experts – as well as the Center’s professional staff conduct research and provide policy recommendations in the key socioeconomic issues confronting the State. For details, or to arrange an interview, please contact Gal Ben Dor, Director of Marketing and Communication 054-464-2333.